If you live in an older building with interior brick walls, the brick might not be as beautiful as the bricks you see on TV, in the movies, or even at your friend’s brand new house. That’s because homes were generally built using the best bricks on the exterior, since that’s what everyone sees. As a result, less beautiful bricks were saved for interior walls that would be covered with different finishing. 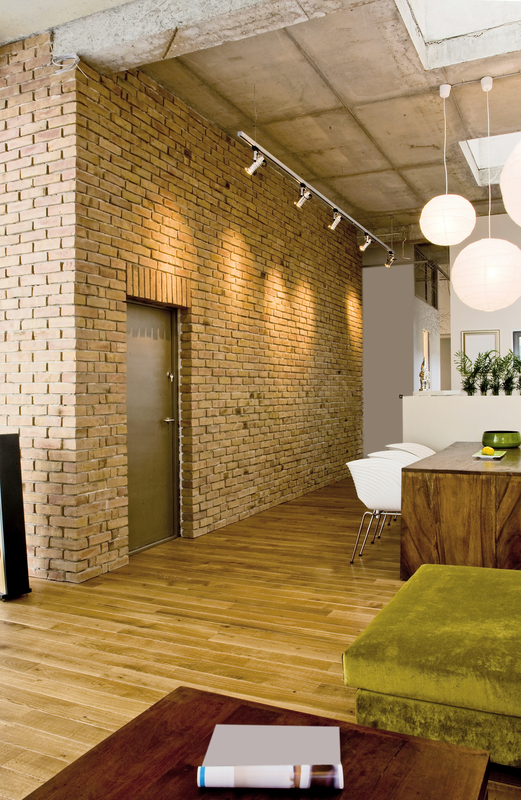 Yet, brick interior walls have become an on-point trend in some of the world’s most fabulous homes. Just take a peek at high-end designers like Burberry and Dior, both of which continually incorporate interior brick walls into the backgrounds of the homes featured in their ad campaigns. It’s officially in style to have an interior brick wall in your home. Many people peel back an exterior wall in anticipation of the brick beneath, only to find bricks that look less than appealing. Rest assured, you can dress up your bricks to look fresh and beautiful! Here we explain how to restore your interior brick walls for a beautiful new look. If your home was built before the 1950s there is a good chance it was built with bricks. If you are unsure where to start in your search for interior brick walls hidden around your home, there are many places to look. In most cases, bricks were used inside in the living, dining and bedrooms. Although, many homes have interior brick in the bathroom and kitchens as well, and adding a brick wall to one of these less expected spaces can be especially awesome. If you want to check if there is brick beneath a certain wall, use a tool to chip at the wall plaster just so that you can see the brick beneath and study the color and condition of it. In order to determine if the brick is in good enough condition to use, it should not break or crumble, or show signs of serious cracking along mortar joints or bricks. If there isn’t any natural brick in your home, you can always fake it by installing faux-brick wall panels. 1. Removing wall plaster and cleaning off the brick beneath will cause a lot of dust to kick up. So start by covering everything in the room, from furniture to floors, and even air vents. 2. Don’t forget to protect yourself by putting on rubber gloves, a breathing mask, and protective eyewear. 3. Next, using a masonry chisel and hammer you will slowly but surly remove all of the plaster covering a specific wall. You do not want to use an electric chisel, it might sound easier but it’s much more difficult to control and can easily cause damage to brick. 4. Use a wire brush to firmly sweep the walls, removing loose plaster that remains. 7. Add a sealant. After removing the exterior covering the brick, the brick is now full of pores that allow water, debris, and even wind chill from outside to enter. By adding a few coats of brick sealant you will preserve and seal off the bricks. Tip: a matte finish provides the most natural appearance. Once you uncover the brick walls hidden inside your home, your expectations might be shattered—and not in a good way. Like we mentioned before, interior bricks are not always the prettiest of the bunch. Interior brick is often an unwanted color, too orangey, too light, too dark, or completely mismatched. If fancy sealant isn’t enough to make your bricks look acceptable, you can always paint brick walls to change the look of them completely. If you notice cracks in bricks or mortar joints, or if brick is crumbly and weak, parts of the brick wall may need to be restored by a professional. You never want to ignore cracked or crumbly brick because it only gets worse over time. Restoring interior brick walls might sound like a fun DIY project for next weekend, but uncovering a brick wall isn’t always as easy as it sounds. Many times electrical units are attached to the wall, which presents a larger set of issues and the need for an experienced professional. A professional can remove the exterior plaster without causing any harm to electrical units. For the best results restoring your interior wall, allow the trusted experts at Turnbull Masonry to take care of the job. Call us today for fast, reliable work you are guaranteed to love.